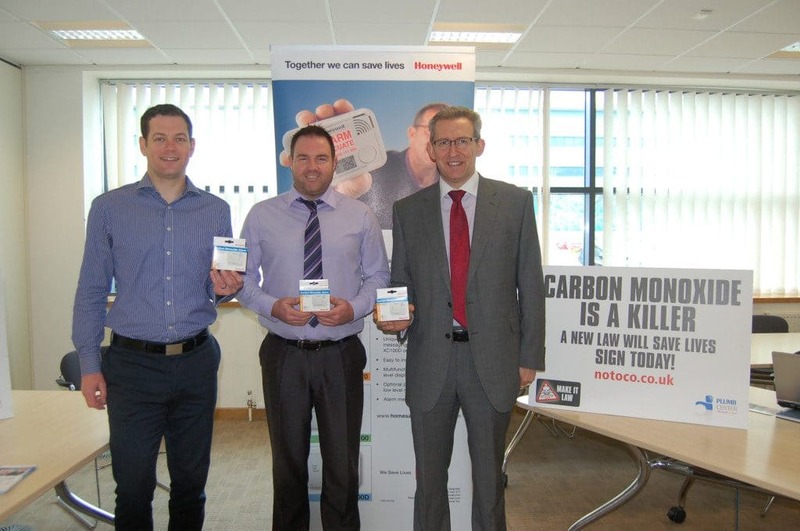 ‘A carbon monoxide alarm can save your life’ – this was the hard-hitting message to employees at Plumb and Parts Center’s head office during a CO awareness day. Employees were educated on the dangers of CO and offered Honeywell CO alarms in return for a donation to the Katie Haines Memorial Trust, raising £1,500 for the charity. Plumb and Parts Center, the Trust and Honeywell have staged a year-long campaign, calling on the government to make alarms compulsory when any carbon-burning appliance is installed. “Over 250 employees work at the Wolseley Center, in Leamington Spa, and Plumb and Parts Center wanted to tell as many employees as we could about the dangers,” said Head of Marketing Julie McLean. Caption from the left – Plumb and Parts Center’s Product Manager, Karl Baggott, Jason Donoghue, Customer Marketing Manager – Construction and Adrian Keats, National Account Manager for Honeywell Analytics.